In this work, a kind of AlN particles reinforced Mg–Al matrix composite was fabricated by introducing Al–12.5AlN master alloy into the Mg melt during casting. In the 0.8AlN/Mg–8Al composite, the nano-sized AlN particles are uniformly distributed, exhibiting a clean interface with the matrix. The introduction of AlN results in the refinement of α-Mg grains through modifying its dendrite morphology, and the β-Mg17Al12 intermetallic was also changed from continuous coarse-like to fine morphology. As a result, compared with Mg–8Al matrix alloy, the tensile strength and elongation of the 0.8AlN/Mg–8Al composite were increased by 31% and 213%, respectively. The strengthening mechanism and fracture behaviors were discussed. In order to overcome the above shortages, other methods have also been investigated. 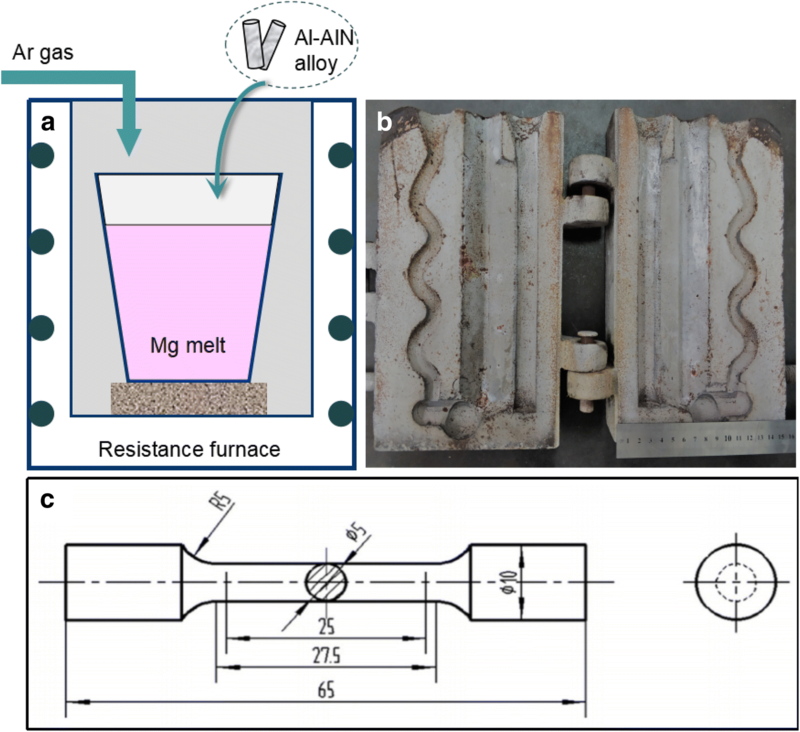 Bedolla et al.19 prepared AlN/AZ91E composite by pressureless infiltration, which performs quite attractive mechanical and thermoelectric properties due to the good wettability and capillarity between the AlN particles and Mg matrix. Yang et al.20 synthesized AlN particles reinforced Mg–9Al matrix composites through nitrogen gas bubbling method, i.e., by carrying out the reaction between N2 and dissolved Al in the Mg melt. Even though these methods can obtain a clean reinforcement/matrix interface and is beneficial to improve the aggregation of AlN particles, they still require a complex procedure and equipment. Using particles-contained master alloy to prepare composites may be another acceptable method, which is not only simple but also easy to conduct. For instance, the application of Al–SiC and Al–Al3BC master alloy can easily introduce SiC and Al3BC particles into melts.21,22 Therefore, in this paper, an Al–12.5AlN master alloy was used to prepare a 0.8AlN/Mg–8Al composite during casting. The stability and distribution of AlN particles and their effect on the microstructure of the composites were investigated. The tensile properties were tested, and the strengthening mechanisms were discussed. The raw materials in this paper contain commercial Mg ingots (99.8%, all compositions quoted in this paper are in wt% unless otherwise stated), commercial Al ingots (99.7%) and Al–12.5AlN master alloys. High-purity Ar gas (99.9%) was selected as inert atmosphere during casting. The Al–12.5AlN master alloy is provided by Shandong Al & Mg Melt Technology Co. Ltd., which is prepared by following methods. Firstly, Al powders (99.7%, 75 μm) and nitride plastid powders (a ball-milled mixed powder containing AlN and Al with less than 0.1 wt% of graphene) were well mixed and cold-compacted into cylindrical specimens. Then, by conducting a liquid–solid reaction at 750 °C in a vacuum electric resistance furnace, the Al–12.5AlN master alloy can be successfully fabricated. Finally, the specimens were extruded into rods at 500 °C with an extrusion ratio of 20:1. The AlN/Mg–Al composite was prepared through the following procedures. First, Mg melt was held at 740 °C under the protection of Ar gas in a corundum crucible using a resistance furnace. Then, the preheated Al–12.5AlN master alloy was added into Mg melt, as shown in Figure 1a. The melt was then held for 20 min, during which regular stirring was applied using a four blade (pitch 45°) stainless steel impeller at 300 r/min for 30 s every 5 min. Finally, after refining and slag removal, the melt was poured into a tensile specimen steel mold preheated to 200 °C, which is presented in Figure 1b. As a comparison, the Mg–8Al matrix alloy was also prepared through similar procedure. Experimental setup for synthesizing 0.8AlN/Mg–8Al composite (a). The schematics of tensile specimen steel mold (b) and the dog-bone-shaped specimen (c) according to ASTM standard. After the samples were ground with sandpapers and polished using a MgO suspension following standard routines. A compositional analysis was performed using an X-ray fluorescence spectrometer (XRF), and the results are listed in Table 1. For microstructure analysis, as-cast and T4 (solid solution treated at 413 °C for 12 h, and then cooled in 60 °C warm water)-treated samples were prepared. Preliminary observations of the microstructure were carried out under a Leica DM2700 High-Scope Video Microscope (HSVM). Further microscopic observations were performed using field emission scanning electron microscopy (FESEM) and transmission electron microscopy (TEM) equipped with an energy-dispersive spectroscopy (EDS) detector. Phase identification of the composites was conducted by X-ray diffraction (XRD) with Cu Kα radiation at 40 kV, 100 mA. After the samples were machined to ‘dog-bone’-shaped specimen (Figure 1c) with 25 mm gauge length in compliance with ASTM E8M-16a standard, tensile properties of the 0.8AlN/Mg–8Al composite and Mg–8Al matrix alloy were tested on a WDW-100D electronic universal testing machine at room temperature. The tensile rate was set as 2.0 mm/min. Real-time monitoring of loads, stresses and strains during testing through computer-controlled data acquisition system was obtained. The average data were acquired from at least five tensile specimens in each case. Figure 2a shows physical photograph of the Al–12.5AlN master alloy, and the corresponding microstructure is shown in Figure 2b. The size and morphology of the particles are presented in Figure 2c. It can be seen that the AlN particles are in nanometric size, with less than 200 nm in diameter. (a, b) The Al–12.5AlN master alloy and its microstructure; (c) morphology of AlN nanoparticles. The microstructure of the 0.8AlN/Mg–8Al composite is presented in Figure 3a. It can be observed that the AlN nanoparticles distribute relatively uniform in the matrix. Figure 3b shows corresponding XRD pattern of the composite, in which the main phases contain β-Mg17Al12 (Cubic, I-43 m, PDF# 01-1128) and AlN (Hexagonal, P63mc, PDF# 25-1133), except for Mg matrix. No obvious oxides (MgO, Al2O3 and MgAl2O4) or impurity phase peaks in the XRD pattern may indicate the stability and feasibility of the preparation process. Microstructure (a) and XRD pattern (b) of the 0.8AlN/Mg–8Al composite. 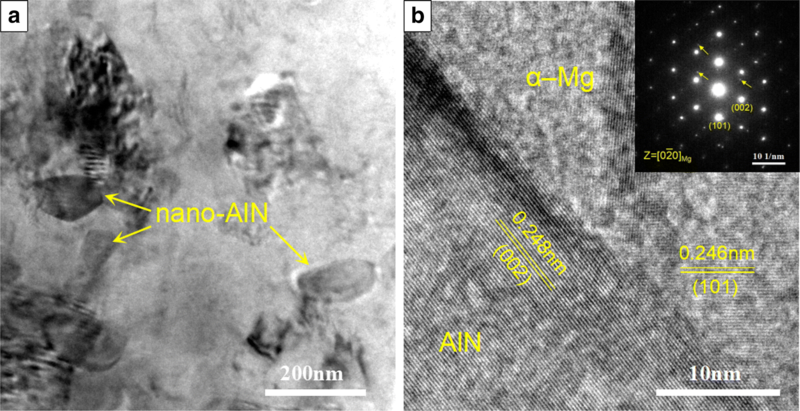 In order to highlight the influence of AlN on the microstructure of Mg–Al matrix alloy, the SEM micrographs of as-cast Mg–8Al and 0.8AlN/Mg–8Al composites are shown in Figure 4a, b. Except for α-Mg phase, the formed intermetallic is β-Mg17Al12, which is precipitated through a divorced eutectic reaction, thus distributing along the grain boundaries. Compared with as-cast Mg–8Al alloy, the grain size of α-Mg in the composite is decreased from 132.7 to 96.2 μm, which is due to the refining performance of AlN particles. Besides, as can be obviously seen in Figure 4b, the secondary dendrite of α-Mg is eliminated, which may also indicate the positive effect of AlN nanoparticles. Figure 4c, d is microstructures of the T4-treated samples. 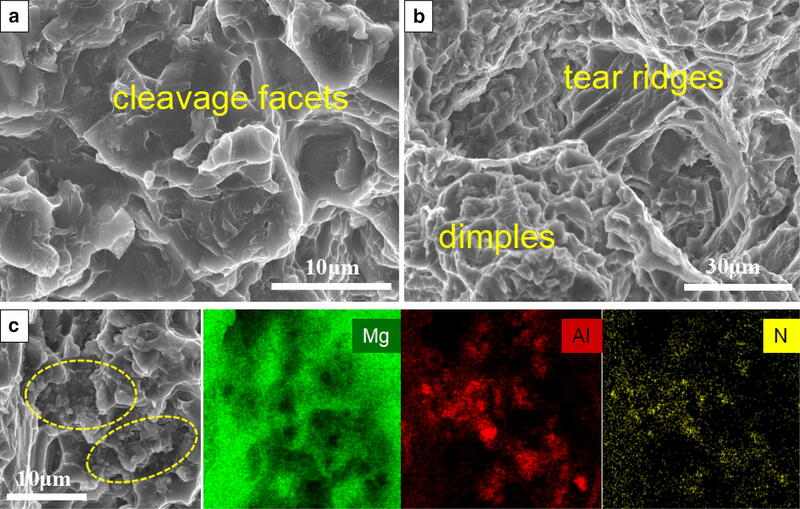 In the Mg–8Al alloy, the β-Mg17Al12 intermetallic fails to be completely dissolved during T4 treating process, and some coarse particles are left along the grain boundaries. However, in the 0.8AlN/Mg–8Al composite, no β-Mg17Al12 particles were obviously observed as shown in Figure 4d. 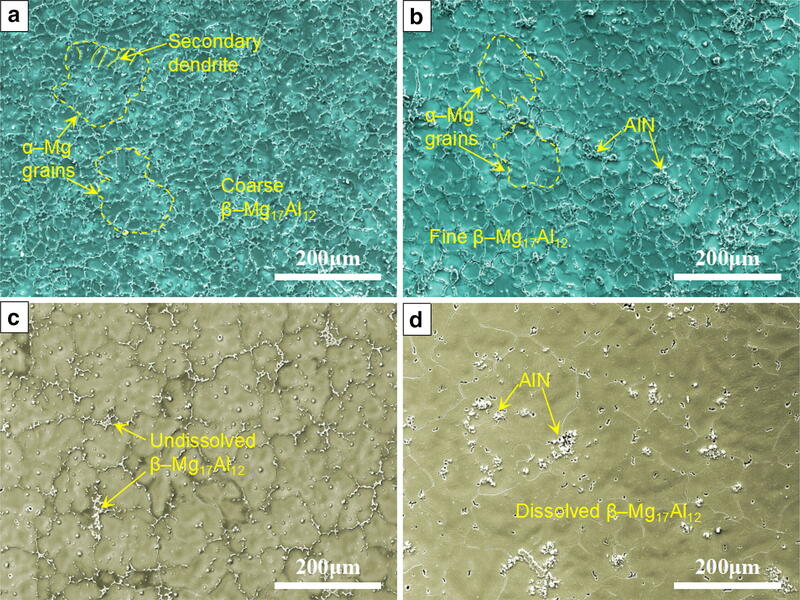 The microstructures of Mg–8Al matrix alloy and 0.8AlN/Mg–8Al composite: (a, b) as-cast Mg–8Al and 0.8AlN/Mg–8Al; (c, d) T4 treated Mg–8Al and 0.8AlN/Mg–8Al. Figure 5a clearly shows the distribution of AlN particles in the composite, i.e., some AlN particles locate along the grain boundaries, while some clusters exist inside the grains. Figure 5b shows magnified micrograph of a small cluster of particles. Based on the EDS spectrum and elemental content, the nano-sized particles were deduced to be AlN particles. Therefore, no obvious size or morphological change of AlN was detected, indicating that the AlN particles keep stable after they were introduced into the Mg–Al melt by Al–12.5AlN master alloy. To further confirm the ratiocination, TEM analysis of the 0.8AlN/Mg–8Al composite was conducted, as shown in Figure 6. From Figure 6a, it was observed that the AlN particles are about 150 nm, again confirming its stability in Mg melt. Figure 6b shows HRTEM image of the interface between AlN and α-Mg matrix, and the corresponding selected area electron diffraction (SAED) pattern recorded near the zone axis of [0–20]Mg is also presented. Based on the interplanar spacing value and SAED pattern, the (002) plane of AlN was labeled (Figure 6b). What’s more, the interface between AlN and Mg matrix is clean and clear. The distribution (a) and EDS spectrum (b) of AlN particles in the 0.8AlN/Mg–8Al composite. (a) TEM image of AlN nanoparticles in the 0.8AlN/Mg–8Al composite. (b) HRTEM image of interface between AlN and Mg matrix, and the corresponding SAED pattern. The tensile properties at room temperature of as-cast and T4-treated Mg–8Al alloy and 0.8AlN/Mg–8Al composite were tested, and the results are listed in Table 2. It was found that the introduction of AlN nanoparticles in the Mg–8Al alloy can obviously improve the ultimate tensile strength (UTS), yield strength (YS) and elongation (δ). Typical stress–strain curves of these alloys are shown in Figure 7, in which the UTS of as-cast Mg–8Al and 0.8AlN/Mg–8Al is 137 MPa and 179 MPa, while δ is 1.5% and 4.7%, respectively. After T4 treatment, the UTS and δ of both Mg–8Al and 0.8AlN/Mg–8Al are significantly improved when compared with the as-cast state. As expected, the 0.8AlN/Mg–8Al composite still exhibits higher UTS and δ values than the Mg–8Al matrix alloy. 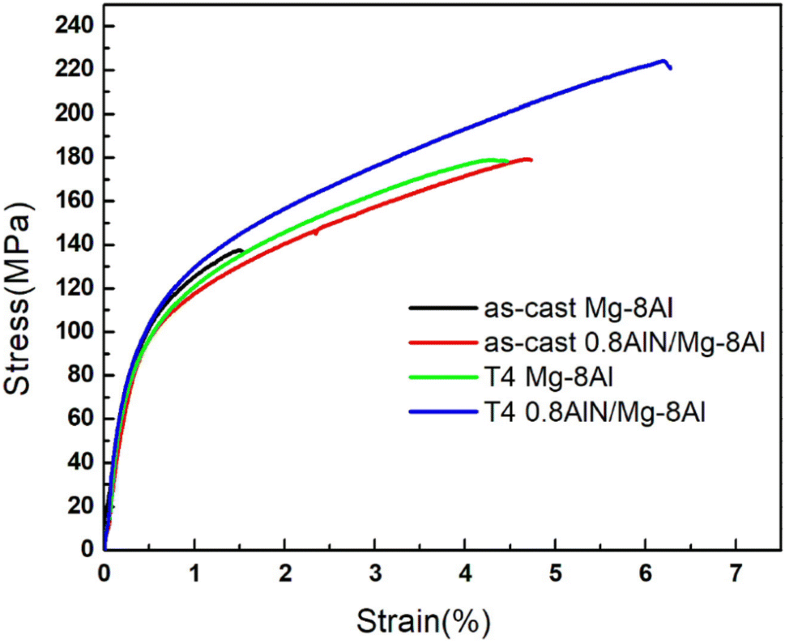 Typical stress–strain curves at room temperature of Mg–8Al matrix alloy and the 0.8AlN/Mg–8Al composite. The results above indicate that the 0.8AlN/Mg–8Al composite performs enhanced tensile properties, comparing with Mg–8Al matrix alloy. The mechanism can be attributed to several issues. First, since AlN has high melting point and elastic modulus, the introduction of the particles may bring attractive strengthening effect. The clean interface and good combination between distributed nanoparticles and the Mg matrix are beneficial to provide pinning effect of dislocations during tensile procedures. Secondly, the reduced grain size of α-Mg also contributes to the improvement of tensile properties, and this effect is more efficient especially in hexagonal magnesium alloys.20,23 Except for grain size variance, the changes in morphology and distribution of β-Mg17Al12 should also be a concern. Figure 8a, c shows morphology and size of the β-Mg17Al12 intermetallic in the Mg–8Al and 0.8AlN/Mg–8A composites, respectively. The distribution areas of Mg matrix and β-Mg17Al12 are presented by different colors in Figure 8b, d. It can be found that in the Mg–8Al matrix alloy, the β-Mg17Al12 particles form a semi-continuous network, which is relatively coarse. However, in the 0.8AlN/Mg–8Al composite, the existence of AlN nanoparticles along grain boundaries contributes to break continuous β-Mg17Al12 network and change its morphology from coarse herringbone shape to fine strip or blocky shape (Figure 8d). This variance is also confirmed by Figure 4c and d as mentioned above, which may also provide a positive effect on mechanical properties. 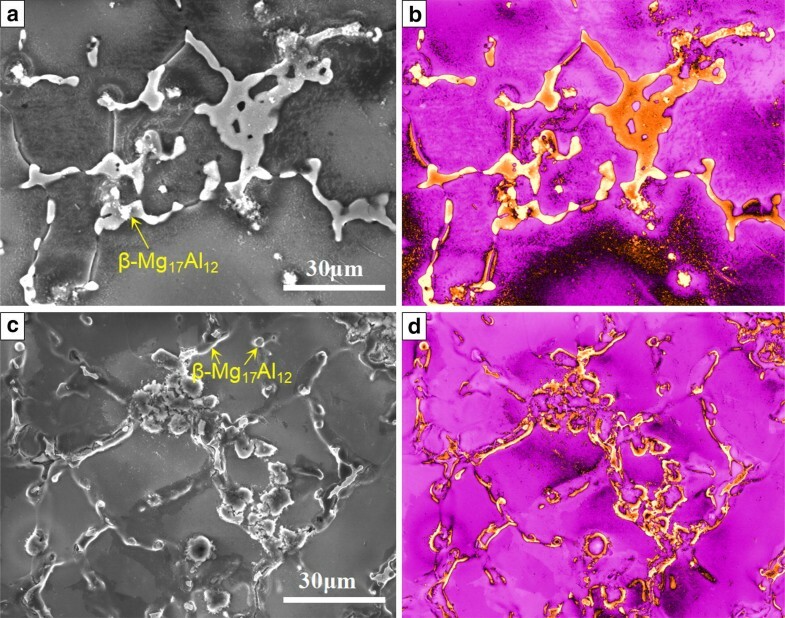 Micrographs of (a) β-Mg17Al12 phase in Mg–8Al matrix alloy; (c) β-Mg17Al12 phase and AlN agglomerations in 0.8AlN/Mg–8Al composite. β-Mg17Al12 phase is presented by yellow color, Mg matrix and AlN agglomerations are presented by pink color in (b, d), correspondingly. Micrographs of tensile fracture surface for (a) Mg–8Al matrix alloy and (b, c) 0.8AlN/Mg–8Al composite. 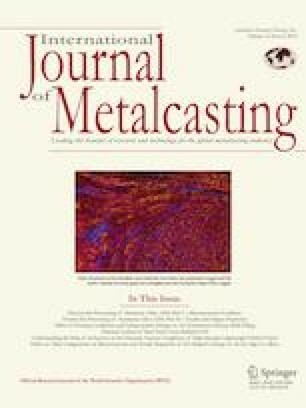 In this study, 0.8AlN/Mg–8Al composite was successfully synthesized by introducing Al–12.5AlN master alloy into Mg melt through a casting method. The nano-sized (< 200 nm) AlN particles are relatively uniformly distributed in the matrix, performing good interfacial combination with the matrix. The strengthening effect of AlN and its modification performance on α-Mg grains and β-Mg17Al12 intermetallic contribute to the enhanced tensile properties of the composite. Compared with Mg–8Al matrix alloy, the tensile strength and elongation of the as-cast 0.8AlN/Mg–8Al composite are increased by 31% and 213%, respectively. The results in this paper may inspire new approaches for the preparation of Mg-matrix composites. This research was financially supported by the National Natural Science Foundation of China (Nos. 51601106 and 51731007), China Postdoctoral Science Foundation (No. 2017T100489), Fundamental Research Funds of Shandong University (2016GN012).